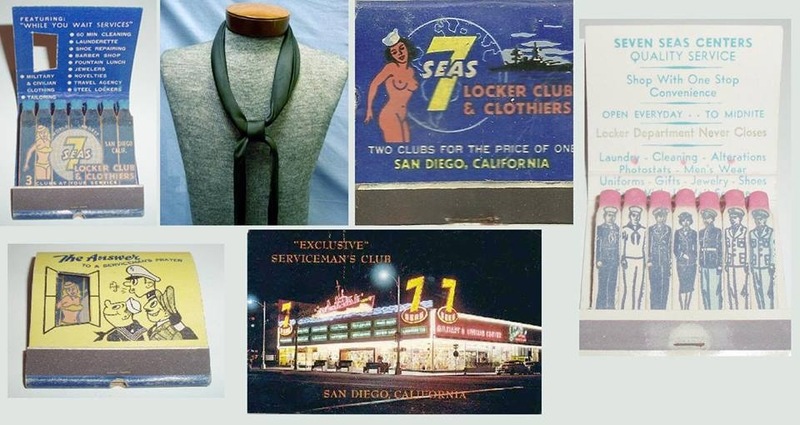 The Seven Seas Locker Club in downtown San Diego was a huge place off Broadway that took up a city block and never closed. You could go there at anytime, day or night, and get your uniform cleaned, pressed or completely tailored, complete with full zippers on each side of your jumper. Don’t forget to get liberty cuffs along with that. Could get your shoes re-soled and have a complete meal. One of the really cool things you could have done there was to get your neckerchief rolled. They had a machine that would perfectly roll it so you wouldn’t look like a boot. At one time, enlisted sailors were not allowed to have civilian clothes on bases or ships. The “7-Seas” provided a very large locker room so you could change into civies and “blend in” to avoid the Shore Patrol. I was a member in1960. Rented a shirt and pants for 25 cents each…went to TJ. How about the Hollywood theatre? And I was a member of 4.0 locker club.